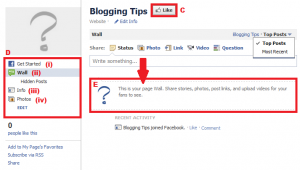 This is a guest post by Ching Ya, one of the three bloggers I regularly recommend for their expertise with Facebook. She is the author of Social @ Blogging Tracker and provides Facebook customization services for small businesses. You can follow her on Twitter @wchingya. Each day, 750 million active users log on to Facebook to connect with friends and family and to support the brands they love. Ever since the introduction of Facebook Pages for business, almost every brand is eager to expand their customer outreach and build their online reputation through Facebook. and as another way to communicate with readers. Why not? Creating a Facebook Page is easy and Free! If you already have a Facebook profile, head over here to create your new Page. 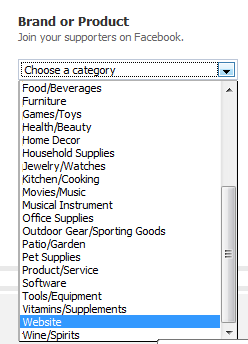 Make sure to select the most appropriate category for your page so your fans can locate it easily on Facebook. After that, name your page before agreeing to the Facebook Pages Terms of Service (TOS). You will be directed to ‘Basic Information’ to add information about your brand. Where your fans can ‘Like’ or join your page as a fan. Once fans are connected to your page, your wall updates will show up in their News Feed (highly affected by the popularity of your page/posts). This button is only visible to non-fans. 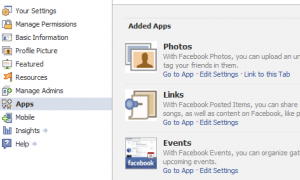 These are your Facebook applications and navigation links. The pre-populated tabs vary according to the page category you selected. You can edit, move and delete unwanted tabs. (i) Get Started (Admin View) – This is an introduction tab by Facebook for new admins to customize their page according to the suggested actions. You do not have to do all the recommended steps given. This tab is only visible to page admins and will stay on your new page for some time. (ii) Wall & Hidden Posts (Admin View) – Wall is where the broadcasting and communication happens: Page admin and fans share status updates, photo, links and videos on the Wall. Fans can select to view Admin posts only by clicking at the Page Name. Next to it is check most popular posts (most commented) for Top Posts or Most Recent posts on the wall. Hidden Posts is a section to display spams based on moderation filters and visible to Admins only. (iii) Info – This tab contains basic information about your website or your brand. (iv) Photos – Admin can upload media files to share with fans and choose whether to allow fans to post theirs. Admin can create albums and place the files in the appointed albums while fans can only submit media files to a general album. page will show up as a photostrip above your page wall. You can ‘edit’ tabs by installing additional apps to your Facebook page. Manage your application list from Edit Page -> Apps. If you are new to Facebook Applications, take a look at some of these recommended apps to encourage fan engagement on your page wall. post with friends – this will increase your page visibility. 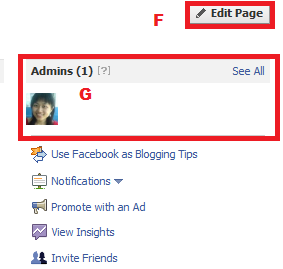 Here is where you as page admin can take control of your page. You can hide your page temporarily until it is ready to be published by limiting its visibility by Edit Page -> Manage Permissions -> Page Visibility -> Only admins can see this page. We will go through other important settings in a later section. Page admin’s profile thumbnail will appear here but is not visible to fans. Remember, each admin has equal rights to add or remove any admin from the page, so be cautious when selecting who to co-manage your page. If you would like to add multiple admins to your page, make sure they have a personal account beforehand. Then you can add them from Edit Page -> Manage Admins by typing their name or email address associated to their Facebook account. A facebook page can showcase who are the admins from Edit Page -> Featured -> Page Owners. 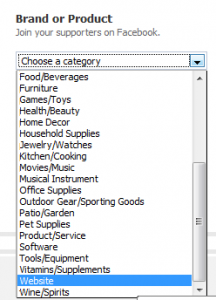 The fields in Basic Information are determined by the page category selected. For example, if your brand is a local business, make sure to put your address and postal code in so your fans can check in your page with their mobile device. You can change your page name only if your page has less than 100 fans. Once you have surpassed the limit, there is no way to edit it. Each page needs at least 25 fans to create a username. Once the username is set, it cannot be changed. 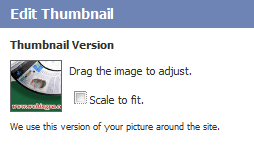 This is a popular feature in Facebook page that allows you to set a default landing tab for non-fans. It is wise to create a call to action for first-time visitors and encourage them to become fans as soon as they land on your Page. Setting up a custom iFrame tab is a great way to display your incentive. land on your page wall after ‘liking’ your page. If there is a spammer on your Wall, you can remove the post or simply report the post as spam to put them in Hidden Posts. Or, you can ban the page/fan who constantly tags your page without permission. The number of people who ‘like’ your Page appears in the left sidebar beneath your application tabs. This list is only accessible by admin and you can make someone an admin or ban a profile/page from the list. Clicking the ‘x’ next to your fan will remove him from the fan list. Facebook Fan Page before liking/posting on other pages. This is a good method to increase your Page’s visibility while maintaining your personal profile uninterrupted by business matters. To post as your page, go to Edit Page -> Your Settings to set it as default; or use it sparingly via the shortcut at your Page’s right sidebar. Chat, Add someone as Friend, etc. Facebook Insights gives page admins an overview of how your fans interact with your page and demographic and geographic information. You can observe how a wall post affects your fans participation and make strategies to increase engagement. You can export the data as a CSV or Excel file. Page admins can send status updates via email, iPhone and text messaging. If you are posting with email, do not disclose your email address to non-admins otherwise anyone can post to your page as an admin. If you accidentally do this, refresh the email address immediately. It takes 14 days before your Page will be deleted from the system. b. Tell your Fans – inform your new page by importing subscribers and customers emails. c. Promote page on website – Add a Likebox so your readers can Like your page easily. e. Send an Update – to fans with filters available. f. Invite Your Friends – send page suggestions to personal friends. Optional: You can connect your page with your Twitter account to cross-post between the two social media sites. It takes time to learn your way around creating a new Facebook page, but the time spent is well worth it. Don’t worry if you need to take baby steps to build your page; Rome wasn’t built in one day either. Just remember to build a trustworthy brand while keeping a human touch on your page through active updates, constant communication with your fans, and lots of creativity. Yes, Katherin, it’s important to create a well-presented page while adhering to facebook term of use as well. Glad you enjoyed the post. recently I create a Face book page for my blog, but I fail to understand its options, these options make me so confused. but when I read this article, every thing is clear. thank you so much “Ching Ya”. its really so helpful for newbie like me. Good to hear, Razz. Glad you find the post useful. This will be useful for me, thanks. Thank you and I’m glad these tips helped. I going to insert the like button, so that the users get my updates on Facebook – the prime advantage they would be immediately aware on the updates of my site ! Thank you and I’m glad the info helps. Appreciate your comment. thank you, Ching Ya, not only for your informative post, but for answering others’ questions after the fact. i stumbled on this article of yours while trying to find out if/how to create a specific album on my “fan” page (besides the big general “Photos of you” where photos seem to land after a follower has posted to the Wall). when dealing with specific, fun photo exercises where followers might like to submit a photo, i don’t want them all appearing on the main Wall, but rather, in a separate album … and obviously an album that followers can submit to (vs. me having to put their photo in there). any suggestions? thank you SO much. Hi illona, thank you so much for your kind words, really appreciate the encouragement. Hopefully they will consider this in near future. 🙂 Finger cross. I have a shop, and the other I wanted to tag one on my facebook site. I know the shortcut @ for doing this, but this wouldn’t work for me. Is it true that you can’t tag peoples names when they haven’t written anything on your wall? Currently page admin can no longer tag friends’ names in a new status update, except in comments (after the friend had commented to a post). 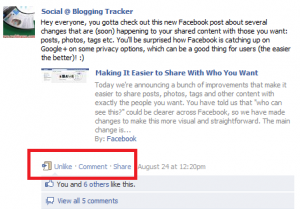 Ching Ya would love you to read ..How to Add Pages You Like in Your (Updated) Facebook News Feed? Thanks for a great article, Ching. I was unfamiliar with the landing page so will be checking that out. I do have a question I can’t find the answer to so far. How can I see “who” likes my page? On my blog I can see who my followers actually are not just the number but on the FB page I only see the ttoal number. It would help me a great deal with marketing if I had their identities. Thanks so much for any guidance you can provide! Hi Beverly, thank you for the kind words. 🙂 To answer your question, page admins used to be able to see their fan list via ‘people like this’, usually the link underneath the total fan number. However, recently there are slight changes to the links so now the fans (people who liked your page) can be located within Insights (kindly refer to the pic here to locate it: http://on.fb.me/v6IGnc). However, do take note that now even page admins cannot access the complete list like before, just a few names which is a bummer. Glad could help out, Beverly, you’re most welcome. 🙂 Best wishes and I’m sure you’re going to enjoy your facebook Page experience. Feel free to drop me a message whenever you have a question. Thanks for your guide, I would wish I had found it before. Is there really now way at all to change page name after you have reached the 100 fans? You see I really wanna change mine back, and there must be someone in the facebook team who can do it? From my own marketing experience, I would like to say that Face Book can become a powerful source of targeted traffic to any website. However, it is extremely important to know how to create a FaceBook page effectively and select the right online promotion strategy. Sure is, Terje. It takes more than just creating a page actually – it’s an everlasting engagement and two-ways communication with your fans as long as the business page still exists. Thanks so much for commenting. I am new at the blogging world and I always wondered how that stuff with the Facebook work. Thank you very much for such and extensive explanation. Thanks a million for these tips! I recently setup a Facebook page but did not know that you can set a default landing tab for non-fans. I thought everyone landed on the Wall. I also didn’t know that you can you can feature pages you like in your page’s sidebar. I will be making some improvements to my page. Thanks again. You’re most welcome, Justin. Hope you’ll have fun trying out the features to enhance your page. Hey this is really very good article about detailed explanation for creating a Fan Page with a SEO tactics. Really you explained very nicely that it will useful for all to create a well built Fan Page. Great article. I am in the process of setting up another page and I had forgotten some of these steps since I did my last one. Thanks, for the refresher course! 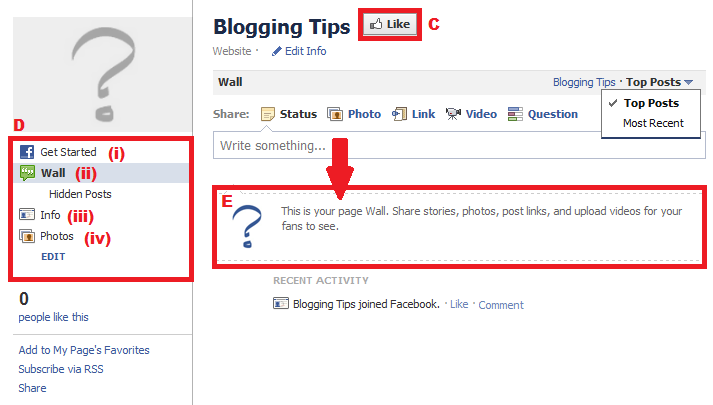 A basic setup guide but for those who aren’t ‘ofay’ with Facebook, I’m sure this will be extremely beneficial to them. There is loads more that can be done with a Facebook page and making use of their API, custom tabs (iframe content), 3rd party apps and other optimisation/marketing tips for the page itself would make a great follow up guide. I always find the new facebook upgrades overwhelming but if got the chance, perhaps a follow-up post would be beneficial to all. Thanks so much for the suggestion, Geoff. Appreciate it. Setting Up a facebook fan page is a great move in getting closer with people and your potential blog readers. Your guidelines helped me in my work, great guide, nice sharing…. A good guiding post on Facebook fan page. thanks for sharing dude. your every post helps me at every new thing and brings something new for me. keep up right and great work. Amazing article, well done! Since social media is now getting more important by the day.It would be best to make our Facebook pages complete and informative to gain more fans and look more professional. Thanks for sharing! Great guide! Very detailed. I figured out most of the things myself back when I created my first facebook page and it wannest to hard. Thought you said some things I never knew about. Thanks @wchingya for this simple to follow guide, another excellent opportunity to plug your blog. Also, with all the $50 Facebook advertising coupons floating around marketing mags you can also get to promote your page for free. BTW, I haven’t seen those in a while, is Facebook still advertising with coupons? We just finished setting up our facebook page for our business and we used a lot of your tips. It can be confusing but if you set it up right in the beginning you will get a lot of customer feedback from it and be able to interact! I learned alot from this post. I’ve been using Facebook for awhile but I haven’t really utilize all the buttons and stuff there. Great guide! I will definitely be sharing with my contacts. Seems a lot of people are intimidated by setting up a Fan page and use their personal profile instead. Big Mistake! Elge, that’s true. Luckily nowadays facebook allows personal profile to be transferred into a Page, but not all the data could be migrated, sadly. I would suggest any brand to start with a Page instead of a profile. Thanks so much for commenting. I don’t remind anyone who have elaborate about the Facebook fan page and how to optimize it perfectly. This is really a classy post. Excellent work Ching…thank you for sharing. Keep it up…! Hi Aswani, great to see you here. Thanks so much for liking the post too. I’m glad you enjoy the post, Irish. Thanks so much for commenting. This is really an great guide to set up a Facebook page for bloggers so I will definitely use this for my own Facebook page. I hope you post more great posts/guide in the future. Great insight! I have just set up a Facebook page with the help of this post. I’ve been meaning to do this for a long time. Thank you Ching Ya! You’re welcome, James. Feel free to ask any questions if have. I may not have all the answers but would love to learn more too. sam would love you to read ..Noahs Classifieds – MUST READ! As usual you create such awesome step by step tutorials that it really helps us feel safe to start. I for one am a visual person who needs to see every single one of the steps mapped out for me or else I get confused. Having resources like this is priceless. Thank you so much. Thank you so much, Eren. 🙂 I too, am a visual person so I’m really glad the images help to explain the post better. Huge thanks for sharing this post on Facebook too, my friend. Hugs! This is solid advice for anyone looking for basic advice about Facebook for beginning bloggers. It covers all the basics without getting too in-depth about any one thing. I’ve had my page for a while now and it’s been fun setting it up and watching the likes grow, having a section for those that haven’t liked the page yet is great, it encourages people to “like” it it and then check it out. Good for you, Karen. 🙂 I would prefer not to ban anybody too, as long they keep the conversation friendly and not being spammy. What a complete guide Ching! I am one of those who are still behind when it comes to social media and harnessing its powers to promote and build relationship with readers. This is an excellent guide for me to get me started. Thank you for that. You’re most welcome, Satrap. 🙂 Facebook is undergoing frequent upgrades from time to time, glad that you find this guide helpful. Thanks for the insight, I have a long ways to go but with this info it should be a little easier. You’re welcome and hope this guide helps. Feel free to ask if you have any questions. Facebook pages offers both regular users and business owners a fantastic opportunity to increase their visibility. I have noticed recently that some of my friends that are Funeral Home owners are even putting up pages for their Funeral Home to show the obituaries. After all, the main reason a person would go to a Funeral Home website would be to read the obituary. Thanks again for a very informative and relevant post. Wishing you best in setting up your very own facebook page too. Wow, great post. Facebook pages are a great way to enhance your brand. I’d like to point something out that I tell all of my clients. Facebook should compliment your website, not replace it. When thinking about an online strategy, your Facebook page should drive traffic to your website. Why? Because on your website you own all of the content. Facebook’s TOS basically says that they can do what they want with your page. Look at what happened recently to Roger Ebert’s Facebook page when he made comments that Facebook didn’t agree with. I like to think of Facebook as a big party that everyone hangs out in. The goal should be to get some of those people over to your “house.” to party too. That’s right, Joe. Facebook page is a social media tool but none of us users own the platform, frankly. Therefore, it’s always important to make full use of Facebook Page and drive readers to our external site where we can have full control of it – that’s the ultimate goal. Hi Chingya! Great to see you over here on Gail’s blog. You have created a very comprehensive guide here and I’m sure I’ll need to refer back to it from time to time. I haven’t had to ban anyone from my page yet, but it’s good to know that the option is there in case I need it. My Page has done well and it’s interesting to find new people to interact with over on Facebook. Some people might be nervous about starting a page but with your guidance they can’t go wrong. I’ve learned so much from you. Thanks for all of your encouragement. Thank you Ileane for your encouragement, you’ve always been a wonderful supporter and good friend. 🙂 I’ve learned so much from you too and you’re right, from someone who’s skeptic about facebook to a believer (at least until now), I’m surprised how much I’ve gained from a business page. I only wish Facebook support team is more proactive, if so that would be a huge advantage to all users. Huge thanks to Gail for prompting me to write about this post. Actually I’m quite surprised how many steps had evolved since the first day I created my own page. Phew! Your title didn’t lie. This really does seem like the “Ultimate Guide” to setting up Facebook. Mine is allready “setup” but I am going to use this to check and make sure it is done “right”. Thank you so much Steve, your comment means a lot. 🙂 Hopefully I didn’t miss much. Thanks for the heads up on these editors, another option is to use Google sites for your Facebook page that takes care of SSL. They are easy to customize and to set up using I-frames.